In this episode, I interview Jeremy Vest, founder of Vidpow, the YouTube-certified agency for big brands and channels including Hewlett-Packard, Funimation, and ServiceMaster. He also created Adobe TV, a video training site for Adobe, and he’s the host of the TubeTalk podcast. 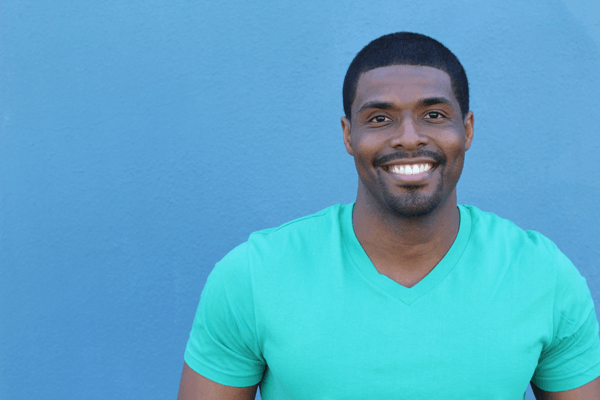 Jeremy explains how to hook your viewing audience and introduce them to your product. 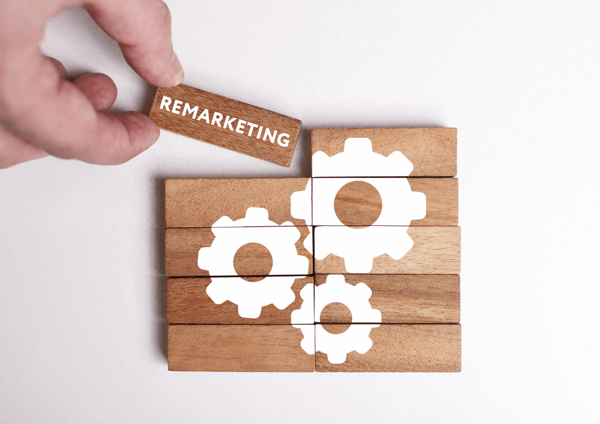 You’ll discover why remarketing is essential to improving conversions from your videos. 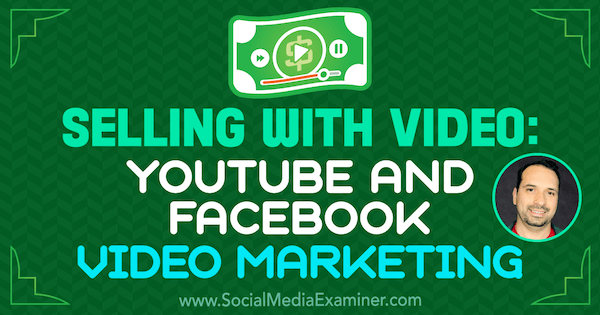 Selling With Video: YouTube and Facebook Video Marketing featuring insights from Jeremy Vest on the Social Media Marketing podcast. Jeremy has been designing websites and marketing products online since 1998. He also loved teaching college-level web design, graphic design, and marketing classes. When Internet bandwidth increased enough to do online videos and courses, Jeremy realized he could teach many more people via video so he created xTrain, a video-based training company. Then, when YouTube came out in 2005, Jeremy started getting into it immediately. About four years ago, Jeremy launched Vidpow, which helps brands with strategy for creating videos. In his work for Vidpow, Jeremy combines his love for design with his interest in marketing, especially analyzing what improves conversion rates. Vidpow does video strategy for brands because many find strategy to be challenging. Vidpow helps brands understand the universe of video and how to navigate it. 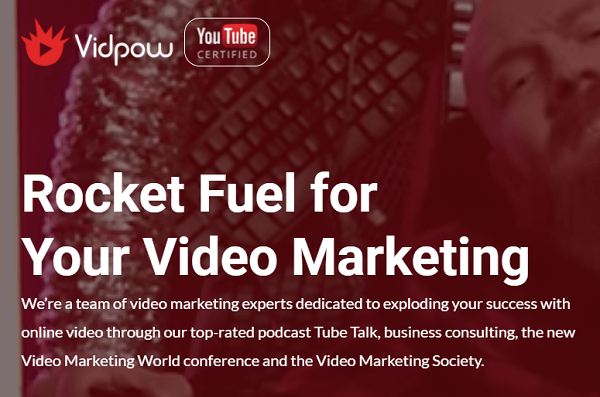 Over four years, Vidpow has helped clients get more than a billion organic views. Listen to the show to find out how many websites Jeremy has created since 1998. After Jeremy helps a client create an awesome ad or video strategy, the first thing the client often asks is, “Why aren’t we getting massive sales?” Jeremy has to explain that there’s no magic pill to sell stuff. It just takes time. Before people take their relationship with your brand to the next level, they need to see your brand 7 to 20 times, whether it’s an email, your website, or social media ads. Even the most viral videos and the best sales videos don’t produce that result. Instead, someone who has watched your video lands on your web page and gets put into your company’s remarketing process. Even the most successful videos pull viewers into remarketing audiences. Jeremy believes that video is better than images for selling online. If a picture is worth a thousand words, what’s a video worth? Text and pictures are great, but video has the highest capacity to show emotion. Showing your product or service with a video helps it sell better than any type marketing, other than connecting in person. Another misconception is that lots of views mean that your video is a success. However, if you’re reaching the wrong people, they won’t watch your video for very long. Because the YouTube algorithm prioritizes how long people watch your content, lots of short view times can harm your marketing. Listen to the show to hear me discuss a problem with an Instagram apps article that received lots of views. Whether your video is on Facebook, YouTube, or Instagram, the first five seconds of your video have to be weird. Seth Godin calls this concept the purple cow. Even if you have a good or great video, odds are most people won’t even watch it. The average view duration of Facebook video is six seconds so you have only a few seconds to engage someone and tell their brain to keep watching. One of Jeremy’s favorites is the video created by Derral Eves and the Harmon Brothers for Squatty Potty. Another favorite is FiberFix. The video immediately poses the question: What would happen if a guy drove a car with joints connected by duct tape off a cliff? And then the car goes off a cliff. People’s brains love mystery; they want to keep watching and see what happens next. Because this video is so engaging and entertaining, the average view duration is through the roof. The opening of your video doesn’t necessarily have to be crazy, adds Jeremy, who has done ads for flashlights and products for other companies. If someone is in the market, and you target the right people at the right time, they’ll keep watching. However, the key is evoking raw emotion, whether that’s laughter or sadness. Next, a successful sales video sets up the problem. For Squatty Potty, the problem is modern humans don’t poop at the correct angle and the video includes scientific studies showing the problem actually hurts people. It’s essential to understand people’s pain and why anyone would care about, for instance, a Squatty Potty. After you describe the problem, then you can describe the solution. When you’re setting up the problem, Jeremy recommends focusing only on products or services for which video makes sense. For example, selling a funeral home on video might be a tough gig, although you could talk about the benefits of the service, payment plans, and so on. Also, don’t be a “me too” product. If your product doesn’t have something that differentiates it from the thousands of similar products on the market, videos may not work for you unless you have a better price or your video appears at the right time and place. Make sure you present a real problem for which a group of people really needs the solution you’re offering. To illustrate how to set up a problem and offer a solution successfully, Jeremy talks about one of his clients, a company called HyperX. In a viral video for the HyperX Cloud Stinger headphones, HyperX demonstrated the problem (gaming headphones are expensive) in various ways. The solution HyperX created was a great pair of headphones for $49. Because people honestly didn’t believe how phenomenal these inexpensive headphones were, the video addressed the issue directly. The video included anecdotes and included funny situations where people didn’t believe how good the headphones were. The video also said, “I know you won’t believe these are only $49.” With these tactics, the video made the headphones’ quality very obvious. I ask Jeremy how long these sales videos typically are. Jeremy says sales videos typically range from 30 seconds to 5 minutes. If the average sales video is around 3 minutes, you spend about 30 seconds on the problem. The videos are very fast-paced. The camera angles typically move every 3 to 7 seconds because people have no attention span on YouTube. For example, the HyperX Cloud Stinger headphones ad showed a benefit, a silly joke, another benefit, a bad meme, a third benefit, and so on. From a psychological perspective, this approach breaks up the content so your video isn’t just a sales ad, it’s a funny sales ad. Next, you offer social proof. Let viewers know that the item was featured on Ellen or in the Wall Street Journal. 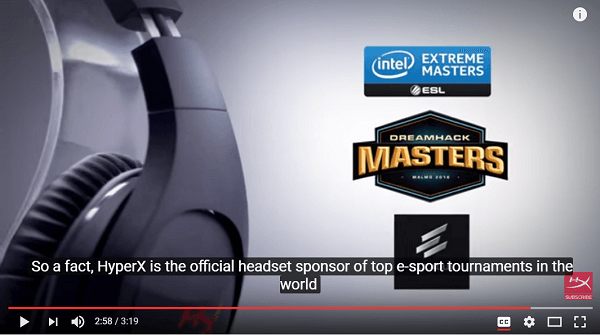 In the case of the HyperX Cloud Stinger headphones, the video talked about hundreds of gaming teams that used the product. Show social proof such as endorsements in your video ad. If someone is still watching after two minutes, they’re either seriously interested in your product or are enjoying the video because it’s funny. Toward the end of the video, explain your offer and call to action. You generally don’t want to mention the price so the video can remain evergreen and usable a few years from now. Instead of naming a price in the video, drive people to a landing page to learn more. Listen to the show to hear how one tactic for a successful sales video is similar to a tactic I used for writing white papers. I recall Jeremy’s point that selling a product takes more than one online interaction and ask how he handles remarketing to people who have already watched a video. When someone visits a landing page, Jeremy recommends telling people how much the product costs, what the benefits are, and why they should purchase it. Although people probably won’t buy when they go to the landing page, your audience will remember the specifics. Then you can target them on Facebook, Instagram, Google, and YouTube. 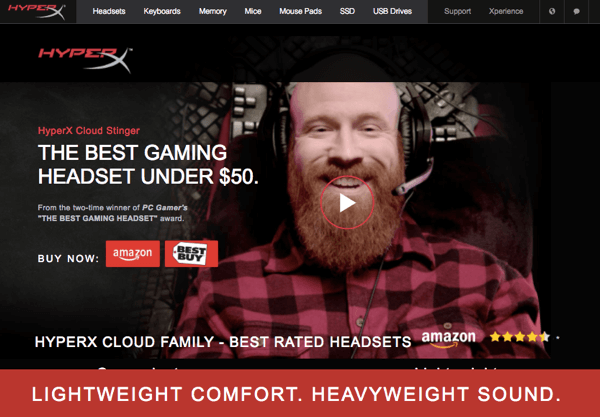 The landing page for HyperX tells people how much the product costs, what the benefits are, and why they should purchase it. For the first 15 or so ad impressions, make the ad content about branding. Then orient the ads to your call to action such as saying “Purchase now” and providing a reason to make a purchase. Ultimately, people need to see your brand a lot before they’ll trust you enough to purchase your product. To determine what an audience sees, Jeremy explains if someone watches this video and that video, they’ll send them to another video or an ad. How they determine what to show is almost like drip email marketing. The content of the ads is often derived from the initial video, like this one. One ad might show only the funny parts. Another might focus on the offer. Sometimes, an ad animates the price coming into an image because most people believe videos work better on Facebook than text and images. 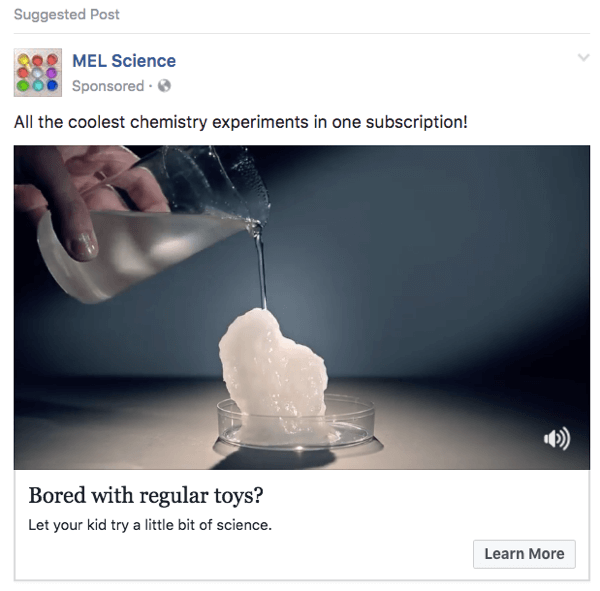 This MEL Science Facebook ad uses clips from a YouTube video. Jeremy says he also runs hundreds of multivariant tests on these ads so he can learn what ads people like best. Listen to the show to hear Jeremy and I discuss multivariant testing of the Squatty Potty video. Almost every cat video ever made will beat all of the marketing videos, so low-quality videos don’t mean that much in terms of conversion, views, and subscribers. Any company or brand can create a video with the iPhone or Android smartphone. For instance, if you have a physical location (such as a sports memorabilia company in Dallas, Texas), you could create a commercial with a smartphone and target people and pages with an interest in sports stuff. When you create low-end videos, remember eyes and audio. They are the only important things when it comes to quality of a video. People don’t tolerate not being able to see someone else’s eyes. For example, when a really wide shot shows someone’s knees up to the head, people can’t see their eyes and subconsciously don’t trust that person. However, if your head and eyes are close to the camera, people will feel more at ease and trust you. Video is all about establishing rapport and trust. It’s important that video viewers can see your eyes easily. Shadows can also make someone’s eyes difficult to see. To avoid this problem, record your video while the person faces the natural light from a window. This approach is an easy way to illuminate someone’s whole face in a flattering way. To record good audio, you can buy a $5 to $10 adapter for your phone that allows you to plug in almost any mic. Jeremy uses a Rode mic and says a wired lapel mic also works well. You can get one for $30 to $80. Also, put your smartphone on a tripod so it’s not moving around. Listen to the show to learn what mic I use while recording video on my smartphone. Whether your text needs to fit within Twitter’s 140-character limit, Instagram’s 2,220-character limit, or some other platform or messaging app, this tool can help. It not only counts characters, words, sentences, and paragraphs, but also tells you how many times you’ve used each word in a chunk of text. CharactreCountOnline.com does more than count characters. For example, if you use the word marketing seven times, you’ll see that below the text box. The tool also tells you how often you’ve used each word as a percentage of the overall passage. With this feature, you can easily identify overused words. To use CharacterCountOnline.com, go to the website, paste in your text, and see how many characters it has. As you edit your text, the stats update immediately. Listen to the show to learn more and let us know how CharacterCountOnline.com works for you. Learn more about Jeremy on Vidpow.com. Follow @VidPowBam on Twitter, Facebook, YouTube, and Instagram. Check out Hewlett-Packard, Funimation, ServiceMaster, and Adobe TV. Listen to the TubeTalk podcast. Take a look at Seth Godin’s book, Purple Cow. Listen to my podcast interview with Derral Eves. Learn more about the Harmon Brothers. Watch videos for Squatty Potty and FiberFix. Take a look at the video for the HyperX Cloud Stinger headphones. What do you think? What are your thoughts on selling with video? Please leave your comments below.